There’s a little bug that has been niggling at me lately, and everywhere I go at the moment I seem to be finding it. Glorified stories of people running marathons, half marathons and the 12km City to Surf after having undertaken absolutely zero training. No don’t get me wrong, kudos to those who have done it and survived with little or no injury, for I really believe you are one of the lucky ones. But in my personal and professional opinion this is a bad example to others and it annoys me that I’m hearing these stories at all, let alone on a local radio station, being gloated about in the gym, or even from other Trainers in the industry. It’s a well-known fact that if you put yourself at the start line of a running event without having done any running whatsoever at best you have the possibility of managing to cross the finish line in one piece, and at worst a possible death sentence. So why would anyone want to take that risk? Have we lost respect for our bodies and the damage we could be doing to ourselves? With the success of such literature as ‘Born To Run’ by Chris McDougall it seems more and more people are taking up running and entering running events. Even styles such as barefoot running and minimalist shoes are becoming more and more popular. The belief that everyone is born to run and that we can just get out there and start racking up the km’s with little to no thought about what is needed for long distances is setting yourself up for failure. While it is true, everyone is quite capable of running, and we all have to start somewhere, I am not sure this somewhere is a marathon or half marathon. Even the most seasoned of athletes still find long distance running events difficult and challenging. A first time runner in a marathon with no preparation is likely to jump off the start line with no idea about pacing although still try to keep up with the general pack. They would start sweating a lot especially as their core body temperature starts to slowly rise. Without hydrating accurately the days before our runner would start to become dehydrated and possibly suffer from low mineral levels supplying the muscles. They will suffer from cramping and their heart rate would soon become elevated and not level out as it does for most well prepared long distance runners.Breathing would become heavier and more laboured the further in the run the first timer gets. Glycogen stores would run out somewhere around the 15-20km mark where things would start take an ugly turn. Blood Sugar would bottom out and with sweaty and clammy skin our first time runner would reach for a carbohydrate gel only to bring it straight back up. Reaching a state of mental and physical exhaustion they would soon start to feel disoriented and with limited oxygen the newbie would stumble down the track, start to feel faint, then quite likely black out. 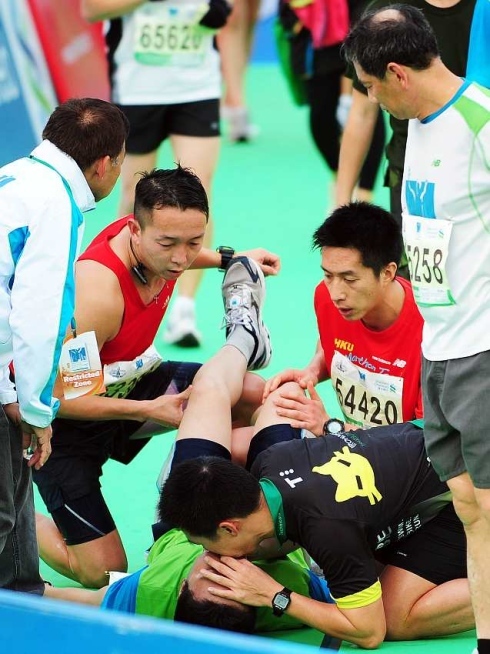 Being unconscious in this situation during an event can lead to a number of additional problems, such as heat stroke, sunburn, kidney failure, arrhythmia, and even cardiac arrest. It would now be up to the First Aid team to treat him or possibly save his life. He may spend the following week or more in intensive care recovering. Over the next few days the runner will be feeling very sorry for himself. If his body hasn’t completely shut down he will know all about DOMS (delayed onset of muscle soreness), blisters, chaffing, sunburn, and the need for rehydration. But he would’ve learnt the importance about seeking advice from a professional before attempting a physical feat such as a marathon. Although I have reviewed one of many possible scenarios (this certainly isn’t always the case), I ask you to consider if it’s really worth it? With the right preparation, of course it is worth it! 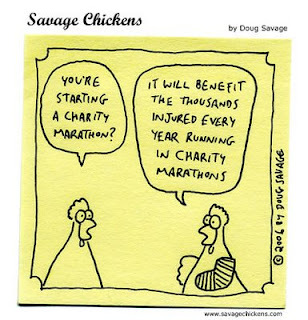 A marathon can be rewarding in more ways than one. Not only will you increase your cardio fitness through training, but you may also drop the kg’s and achieve something amazing. With a suitable training program and extensive event prep you can indeed cross the finish line with a smile on your face and sense of achievement that few of us experience. So for all those aspiring runners out there do yourself and your body a favour and make sure you put a bit of research into what it takes to achieve your goal. Don’t listen to anyone who tells you they’ve run an event with no training because these are likely to be the same people who don’t tell you about their subsequent injuries or problems, or who even don’t know yet about the damage they might have done to their muscles or health. Respect yourself and the distance enough to see a health professional before undertaking any long distance running event. Make sure you set yourself up with an adequate training program that progresses distances slowly without causing injury. Also consider taking on a strength program to keep your joints and muscles strong enough to handle the impact that road running has on the body. Speak to current competitors, coaches and experts on the subject to give yourself the best preparation possible going into an event. Because the risk of not doing so could cost you more than you realise.